AUTUMN – A Time to Shed the Old. I don’t know about you but Autumn is well and truly in my bones! It’s this time of year that I get so confused, one minute it’s 20degrees and the next it’s feels quite chilly. My mind says wrap up and then the sun comes out and I’m all a hot mess! Did you know that women are cyclical beings and one thing that makes us different from men is they live a very lateral, logical existence – they focus on a goal, pump at their testosterone and move in one direction towards it. Women on the other hand work best when in tune with their cyclical nature. Ancestrally we have always worked alongside the moon cycle, the seasons and of course our very own menstrual cycle. Did you know, a women’s menstrual cycles and stages of life are intrinsically linked to the cycles of the Earth, Moon and Sun. The moon cycle is 29.5 days, and the average woman’s menstrual cycle is 29.5 days. Women whose cycles are closest to the 29.5 day cycle have higher rates of fertility. In addition, there are 13 moon cycles in a calendar year, and the average age of menarche (a girl’s first menstruation) is age 13. The average age of menopause is 52, which is also the number of weeks in a year. There is an average of 4 weeks to a women’s menstrual cycle and 4 seasons in a year. Women’s ancient menstrual calendars consisting of notches carved into bone or stone are said to be some of the earliest forms of calendars known. Women’s wombs hold a powerful connection to the astronomical cycles of the Earth, Sun and Moon. What?! Amazing eh?! With this in mind, what does Autumn require us to do as women? 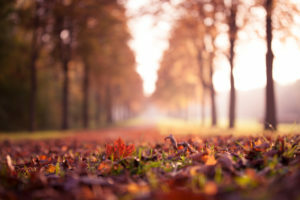 As the leaves fall from the trees, so must what we want to let go of whether this is in the form of out-dated beliefs, bad habits, low vibe people or relationships or even mind-numbing work or home life. Whatever it is, now is the time to let it go. As Winter sets in, that’s when we sit quietly in our stuff, calibrating and getting ready for our rebirth aka Spring time, before we fully blossom in Summer! See it’s quite simple how it all works. For far too long, we have been going against our nature and have created a life where we are constantly on. This inevitably is unsustainable and leads to emotional and physical breakdown or illness. Time to stop the rot ladies and return to what we know inside. Tune in to your inner wisdom and embrace your cyclical self. 5 years ago if you had told me this, I wouldn’t have believed it but now I am a complete convert, I’m on during my post menstrual and ovulation time (Spring and Summer) and off during pre-menstrual and menstrual (Autumn & Winter). I’m off during Autumn and Winter and on during Spring and Summer. By doing this, you will return to a balanced life with your emotions and physically feel stronger and better in yourself. So as the leaves fall from the trees and cover the tree roots with a blanket of protection ahead of Winter, do the same. Get ready for your rebirth. Shine on Sister. Here’s to laying the foundation for a sparkly 2019.